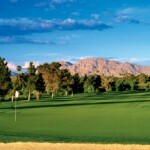 You will forget you are in the desert when you visit Las Vegas National Golf Club. 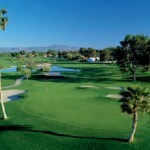 Formerly know as the Las Vegas Hilton Country Club, and located just 2 miles from the Las Vegas Strip, this exquisite championship course hosted the PGA Tour’s Las Vegas Invitational throughout the late 1980’s and early 90’s. 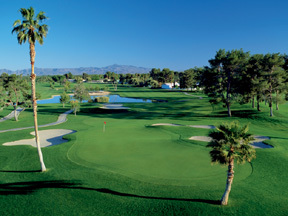 Classic in design, Las Vegas National Golf Club combines rolling fairways, glistening lakes and smooth greens well protected by lush palm, pine and olive trees. Las Vegas National Golf Club measures 6,815 yards from the Championship tees with a slope rating of 130, and 6,418 years with a slope rating of 121 from the regular tees. 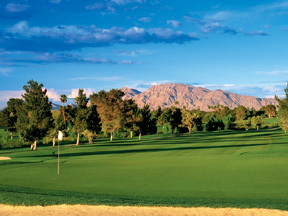 The wide fairways and open landing areas makes Las Vegas National a course that players of all abilities can enjoy, but the course features five challenging Par-3’s that provide the challenge better players are looking for. Book Las Vegas National Now! 2019 Maintenance Schedule: Greens aeration 6/18-6/19/19.